DesignApplause | Eco friendly. Recycled aluminum tiles. Metal traditionally has a tough reputation, but with Eco Friendly Inc.’s recycled metal tiles- it gets a little softer. 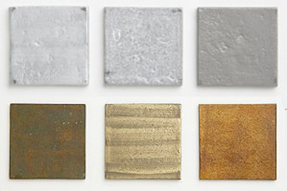 The tiles are either brass or aluminum, and clean easily using mild soap and water. 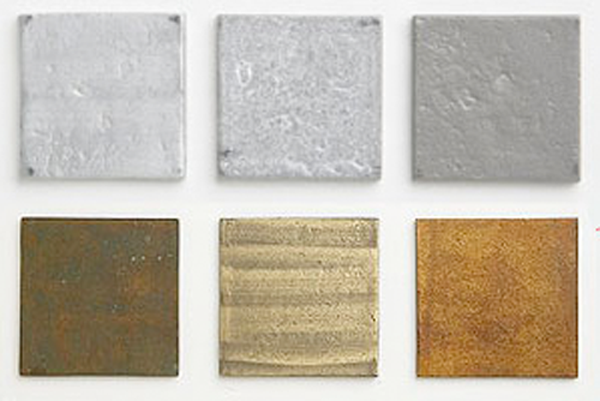 The neat array of finishes make these tiles versatile style-wise. 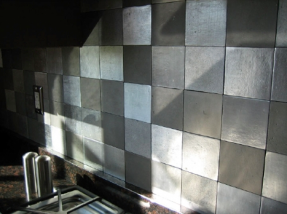 Aluminum tiles are available in the following cool finishes: brushed, vibrated, matte and mirror. The brass tiles offer a warmer vibe and come in: orange, sandbrushed, brown-green and green patina finishes. If you can’t decide on one solid look, you can combine several of your favorite picks to create a more colorful, mosaic affect. The tiles come in both square and rectangular cuts, although a larger stock of the square is maintained. 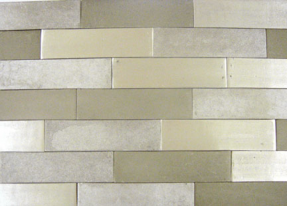 Aluminum squares run from about $35/sf, and brass $70/sf. Whether your tastes are more classic or veer nearer to the edgy- these tiles can give you the look you want. And recycling, by design, is a savvy way to be eco-friendly.